We spend so much time helping other people - our families, our customers, friends, colleagues.. but who looks after YOU? Tonight I’m on the Motivating Mum Facebook page (7:15pm Sydney time for 10 minutes!) 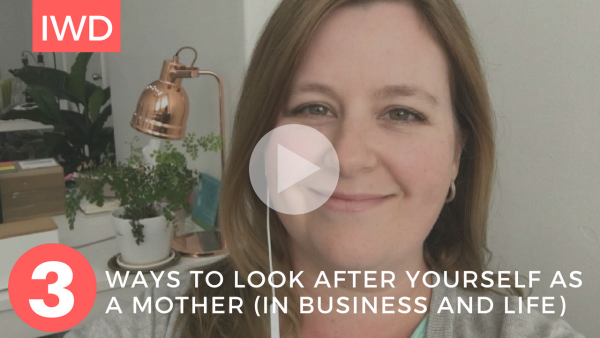 sharing 3 things you can do to look after yourself as a mother - so you have the time and energy to ENJOY your business, your family and your life - not just struggle through it! 1. Schedule down time and do it consistently so it becomes the “new normal” for everyone: Once you lock it in and do it consistently, everyone - your kids, your clients, your friends, everybody just accepts it. I promise, they do. in my house, we eat breakfast every morning, we have a shower every day, and mum goes to the movies every week. Don't feel guilty about it! It's like the oxygen mask on the plane - you have to put yours on first and stay well so you can then look after everyone else. 2. Set up systems and boundaries to give you back your freedom without adding to your expenses: So much of what we do is repetitive! So let's tackle those repetitive tasks in a way that give us more space. Boundaries: I'm kind but firm when my kids want to argue. It's not perfect, but most times it cuts arguments short (especially when it's not a big issue and they are mostly tired or hungry). A simple, gentle 'no' works way better than a long explanation of why not. If I keep getting the same complaint, my answer stays the same too. Think habits and templates. Let's use email for this example. Answer with simple replies - 3 lines max, kind tone, but no fluff. Set up common responses as templates (check your Sent items for your most common responses and use those as a starting point). Then put those responses into an FAQ’s page on your website and enjoy less email! After a week or two all this becomes the new normal for you and your clients and customers. 3. Build your own village: I promise you're not the only time poor parent trying to juggle work with family life and feeling exhausted and guilty as a resort. So let's find the others who are in the same boat and help each other! In life: Team up with a few other families in your neighbourhood to handle childcare needs so you can work on your business before midnight or have your downtime - and they can too. Every Tuesday is "Friends over day" at our house. Family, school friends, neighbours - everyone can come over between 3pm - 5pm and parents can either stay for a cup of tea with me, or drop off and pick up and have a quiet afternoon to get things done or relax. On Thursdays, my kids go to a friends house and I get the down time / uninterrupted work time. In business: Collaborate with others in your field - don’t stress about competition, there’s room for everyone to succeed! Look at all the women coming together today thanks to Alli at Motivating Mum! Yes, we are busy mums as well as entrepreneurs - today’s event took 10 minutes for each of us to film and I’m spending a few minutes this morning and this evening sharing some of the other videos with my audience.